Hello there! I haven't posted in a while - my maternity leave is officially over and my teacher self has returned to the classroom for two days a week. It's going really well so far! We have even set up our own blog for the students and families (can't share it on here due to privacy reasons), but I've been extra busy setting up that blog and website as well! Did you enjoy my previous post about Rainbows? Well here are three simple ways to bring some rainbow fun your little one's sensory play time using humble food colouring. Best. Idea. Ever! What a feast for the senses! Touch - the rice is so much fun to hold and move around and let it run though little fingers. Try adding funnels, cups and containers for pouring. Smell - add a scent! Simple to make with endless possibilities for play, art and craft. For my first attempt I simply soaked the rice in water with a few drops of food colouring (the longer you soak the more vibrant the colour). Next I placed it on paper towel to dry (make sure it's completely dry or else it will go mouldy when you put it in a sealed container). 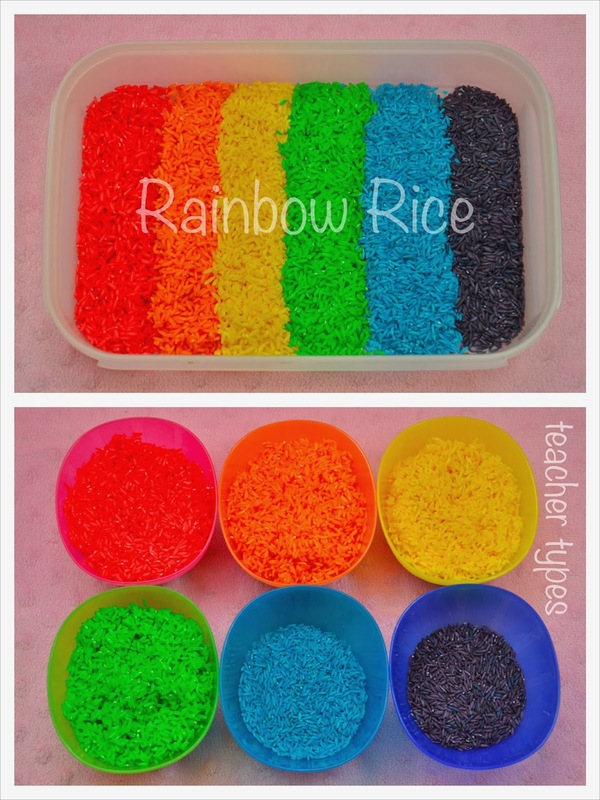 Older children could even use glue on card to make a rainbow rice pictures! So if your child is 4 or older, they might enjoy playing with these colourful ice cubes on a hot day! 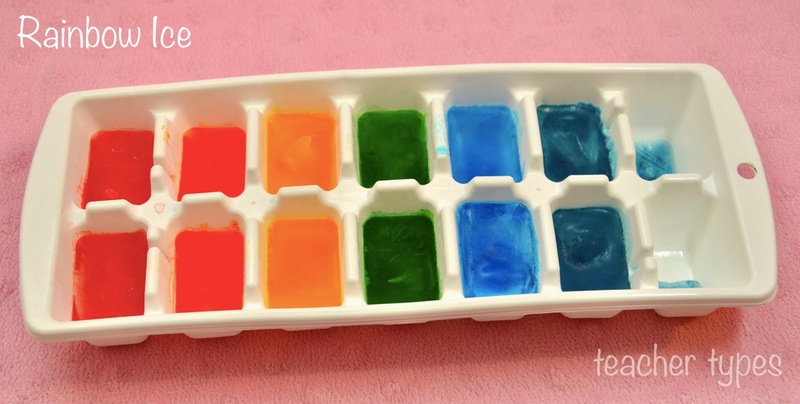 Involve them in the process of mixing the food colouring with the water, and carefully pouring it into the ice cube trays. Discuss how long it takes to freeze, observe how long it takes to melt. You could even freeze little berries or pieces of fruit in clear water ice cubes as a cool treat! Visit my friend Sarah Tamblyn's blog here to see a great "ice" idea she came up with for her 4 year old archaeologist! This idea is on my to-do list! 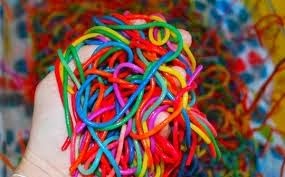 I love that it's an edible sensory rainbow play idea. Can't wait to try it with my little one. One of my favourite blogs I follow is Mama OT. 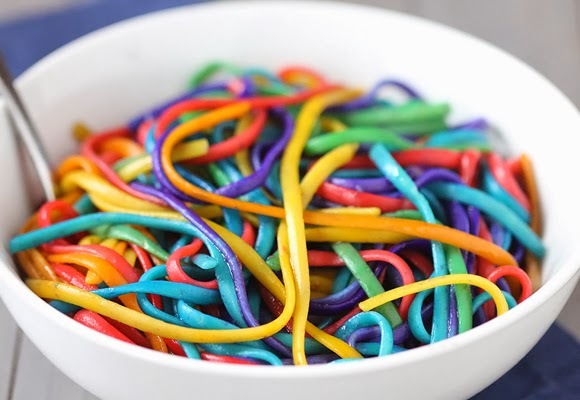 Click here for helpful step by step instructions on how to make rainbow spaghetti and why sensory play is so beneficial for young children's development. While you're there have a look around her website - so many good ideas. Right... so I have another simple baby play post in draft form, soon to be posted in the next few days. Also, I'm in the process of helping plan my sister-in-law's baby shower and hopefully I'll post some photos of some of the cute little ideas I've come up with to make her day extra special!